Neon Chrome is a top-down twin-stick shooter from indie developer 10tons that blends together inspiration from a whole array of cult science fiction. It’s most obvious take is from 80s classic Blade Runner although going by its narrative and certain events within its gameplay there’s a distinct vibe from the likes of Ghost in the Shell, The Matrix, and even Vanilla Sky. They most certainly sound like solid ingredients to base its influence on, but has it all been concocted together well enough to be interesting? You play as an unnamed hero who’s persistent in taking down the corrupted Overseer – an elected guardian of sorts who is neurologically connected with the megastructure that colonises hundreds of thousands of residents. Many of these occupants are known as assets, who find slumber in casks designed for human hibernation for those wanting to wait it out for a better future. 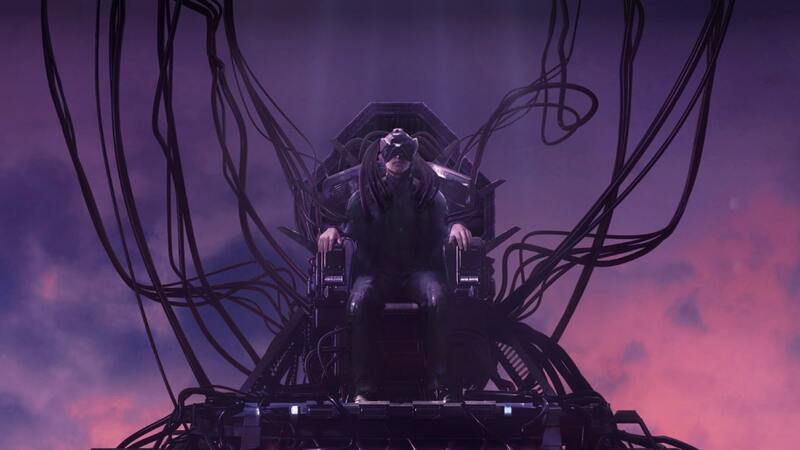 You awaken and control an asset, taking advantage of any skills that they may possess by hacking into them using a VR unit in order to take down Neo-Corp. – a company that once started out in VR game development before pretty much evolving into Skynet. As involved as the story may seem, it’s actually presented to you very briefly, most of which are in passing segments within certain points of gameplay. You aim to climb levels of the tower block by completing a few basic objectives, usually in the formula of destroying some beacons, finding key cards, and scrambling to the exit. It’s the gunplay where the main focus is though, as you blast your way through destructible walls to take down the enemies and robots that try to put an end to your plan. Eventually, your asset will die, probably quite quickly in fact. In which case you are disconnected from their body and booted back into your hideout where you can select another host to carry out your bidding. It’s also the main hub where you begin to level up your stats by using any currency that you earn with each run through. This leads to the early stages of gameplay becoming nothing more than a suicide mission as you work to earn enough currency to increase your health, damage, luck, and so forth. Not to say that Neon Chrome in its early stages is unfair by any means, as it does allow you to save your progress as long as you can reach the five-level checkpoints within each run. Most levels minus the boss battles are procedurally generated, making every playthrough a different experience. The asset skills are also randomly displayed from a selection of about four dozen combinations, with one of three classes available to choose from. The asset card will show you the host’s unique ability such as the hacker perk for example, that allows you to unlock security safes for loot as well as disable certain traps, or the assassin type, that dons a quieter and faster walk speed to help take your enemy by surprise. The cards also give you a heads up on your primary and secondary weapon as well as the name of the poor soul that you are about to possess, with Maxwell Lovelace by far being my favourite name that I’ve come across. You can upgrade temporary perks that are valid for each run through by looting safes and boxes. Some loot may increase your weapon capabilities, others may even have a new weapon to swap with, but the most interesting is the ability perks that take up slots within your inventory. These perks may allow you to hit harder, or become invisible whilst stood still among many others. Better yet, you can acquire several at once depending on how many slots you have available, giving you more reason to want to stay alive. Like I said before, in order to reach a save point you must successfully complete five levels without failure. Although, in order to complete your fifth floor you must face a boss that wants to grind your guts for garters. The boss battles are actually quite tense encounters, given what’s at risk with some not making it completely obvious at first in what you need to do to take it down. The first boss, in particular, reminded me of the showdown between Major and the armoured spider from Ghost in the Shell, as it chases you down with a field of bullets whilst destroying the environment into a stack of splinters within its wake. There are five boss encounters found in Neon Chrome although there are only three different enemy types, one of which gets recycled several times, which does feel a bit lazy given how basic the graphics are. Whilst it does visually set the mood nicely with colours almost handpicked from the purple fields of cyberpunk culture, the 3D graphics that it presents itself with are built with an embarrassingly low polygon count that would look more at home on a Nintendo 64 than anything else. What does not help the matter is how the screen looks as though it’s been smeared with vaseline in a seeming attempt to disguise the poor visuals. This makes playing in Handheld mode a little uncomfortable especially because of how far back the camera is fixed, pushing its disguise even further. When playing docked in TV mode it exposes its visual discrepancies even more, actually making me prefer playing it in handheld. At least the music is decent enough, drawing out the flavours of its 80s visual glow with synth music that compliments the action well if a little lacking in track variety. The controls are decent for the most part although the aiming can feel a little loose. I didn’t feel as accurate as I would’ve liked and much preferred the tighter feel that something like Neurovoider possessed. This could also be a result of how far back the camera is fixed which forced me to prefer the spread trajectory of shotgun type weaponry. The gameplay itself does happen to be quite decent as each run is the learning experience that you would expect from a roguelike title. You begin to understand enemy patterns with experience and the more you level up the more involved and immersed in the action you become. The fact that you can be so easily motivated to surpass a five-stage goal gives you a reachable target every time you decide to have another pop at it. There’s also an incentive to keep replaying the campaign as each time you finish it there’s a higher difficulty waiting as if your fighting against a later model – overseer 4.0 for example. This makes levelling up feel less overpowered and more useful. The fact that each level is always laid out differently also helps to keep replayability interesting. You do have an option to bring three other mates into the action simultaneously, just don’t expect to split the Joy-Con as a convenience because it doesn’t support it due to the lack of a right analogue stick. I do believe this could have easily been worked around by mapping your gun directly to the face buttons and sacrificing the reload action. Regardless, they kept the decision to leave the possibility out. In a nutshell, Neon Chrome does set out what it aims to do by giving you a decent top-down shooter that is fulfilling enough to play through at least once. The randomised level layout keeps the action diverse and can drive some to keep playing a long time after you first see the credits roll. It may look very low budget in presentation but what it lacks in visuals, it makes up for in atmosphere.